Enjoy haute Southern cooking in a contemporary setting. 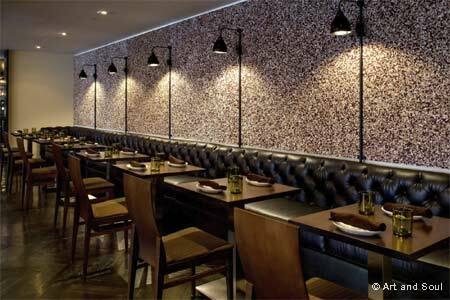 : One of Capitol Hill’s classiest eateries is on the ground floor of The Liaison Capitol Hotel, just off the lobby, making this a convenient stopover for Hill types on their way to or from meetings: keep your ears open, as you may hear some interesting political tidbits. It’s also the brainchild of owner-chef Art Smith, and showcases comforting Southern regional cooking handled gently. The lunch menu is replete with hoe cakes and burgers, plus an array of more serious eats: steak frites and roasted salmon. In the evening, look for such entrées as roasted pork loin and fried free-range chicken for two, and all sorts of must-have sides. Check out the happy hours and several nightly specials. In warm weather, eat on the "pooch patio."